Each July Silver and King salmon return from the ocean by way of Brooks Lake and swim up the Brooks River to Naknek Lake. Brooks Falls is just one obstacle facing these salmon. 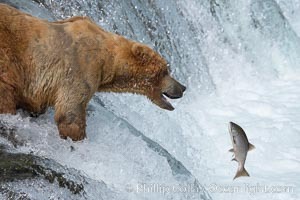 Not only must the fish leap high enough to reach the top of the falls, they must also avoid the Grizzly bears that try to catch them below, at and above the falls. Dozens of Alaskan brown bears are found in the Brooks River area in July and many are often seen at the falls or in the river below the falls each day. When the salmon run has ended, usually by late July, the bears disperse, only to gather along Brooks River again in September as the dying salmon, too weak to swim, float back down the river after having spawned out in Naknek Lake. To find other prints that may interest you, use my Image Search to access over 35,000 images available NOW on this site. Or you can review a Stock List of My Subjects, Categories and Locations, but be prepared: it is a long list. Note: my online database offers "thumbnail" and "large" versions of each image and video for your review. For security reasons I must limit the number of "large" versions and videos that each visitor is permitted to view. You have viewed 617 "large" images and/or videos which exceeds the maximum allowed. You are now able to view "thumbnail-sized" images only. If you are serious about reviewing and licensing my photographs, please contact us and I will immediately remove this restriction, enabling you to continue viewing the "large" versions of my images.